There's no doubt that Sepultura guitarist Andreas Kisser knows how to shred, but on his new double CD "Hubris I & II," the Brazilian displays a different side to his playing and songwriting. He mixes rock, blues, classical, flamenco and Brazilian folk music to create an eclectic blend of harmonious moods and melodies, yet remains close to his metal roots. A few songs from "Hubris I & II" are not too far off the path in similarity to what Andreas created in Sepultura with "Kaiowas" from Chaos A.D. and "Ratamahatta" and "Jasco" from "Roots." Sepultura have explored and created a Brazilian flavor within some of their music, and this is what Andreas does on his first solo album, which took 15 years to complete. While listening to "Hubris I & II," you have to keep your mind and ears open; the thrash and death-metal sounds of Sepultura it is not. But what it is, is a great display of musicianship and craftsmanship from hardworking musicians who only wanted to create an album that means something to them. "Hubris I & II" is an album of two halves: The first disc is all electric guitar, the second is all acoustic guitar with other instruments mixed in. Half of the songs that have vocals are sung in Andreas's native Portuguese. He is credited with guitar, bass and vocal work. Drums are handled by Sepultura drummer Jean Dolabella. The rest is handled by Brazilian friends and local musicians Andreas asked to be on the disc. Best tracks on "Hubris I": "God's Laugh," Virgulandia," "R.H.E.T.," "Em Busca do Ovro," Lava Sky" and "A Million Judas Iscariotes." "Em Busca do Ovro," (gold rush or gold hunt) was inspired by the Brazilian gold rush. The song displays great emotion and melody. Veteran Brazilian vocalist Zé Ramalhem tells the story of the quest for gold and the inhuman acts that followed. If you do a Google search for the translation of the lyrics and watch the video, you will have a complete understanding of the mood and meaning Andreas was going for. Rapping "Virgulandia" is about impunity and the injustices of the Brazilian judicial system. It's also in Portuguese and has a catchy chorus and a groovy beat that boasts lyrics about how ridiculous the Brazilian prison system is. Best tracks on "Hubris II": "Worlds Apart," "Breast Feeding," "Page" and "0120." "Sad Soil" kicks off disc II with a sombre-yet-uplifting emotional guitar solo. The piano interludes on "Worlds Apart" cascade nicely between acoustic guitar and cello strings. "Breast Feeding" introduces Andreas' flamenco classical guitar stylings and Latin percussion rhythms. "Page" continues where "Kaiowas" ended and could have been a Sepultura leftover, with its similar acoustic and percussion sound. CD closer "O Mais Querido" is Andreas' tribute to his favorite Brazilian football club, Sao Paulo FC. "Hubris I & II" is an excellent collection with not too many bad points, although "Protest" and "Euphoria Desperation" from disc I feel like they're fillers, not complete songs. They are good for what they are, but if they were a little more developed, they would be great songs. 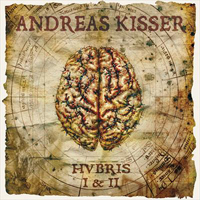 Andreas hasn't quit his "day job" and will continue to record and tour with Sepultura, but "Hubris I & II" is a nice change and a commendable effort for his first solo outing.